If you’ve tried to find kids’ media that is gentle but edgy enough, that respects a kid’s need for safety and curiosity about danger, then you know you’re in for an epic and unsatisfying quest. We’ve waded through all sorts of “kids” movies. Some left Jo huddled in the corner of the couch with hands clapped over his ears (Cars), others that had great moments (and songs!) but required tons of challenging explanations and fastforwarding through scary parts (Chitty Chitty Bang Bang). We came really close with the Herbie the Love Bug movies, but there was some sexism in those that pissed me off. So it was a profound relief to discover My Neighbor Totoro. Jo and I were both completely transfixed and delighted. The main character girls are curious, vulnerable, angry, kind and determined as hell. Totoro naps in a huge, soft cuddly heap, and carries the girls, safe in his tufts of fur, as he flies on a spinning top in the night sky and bellows a fierce, resonant roar. 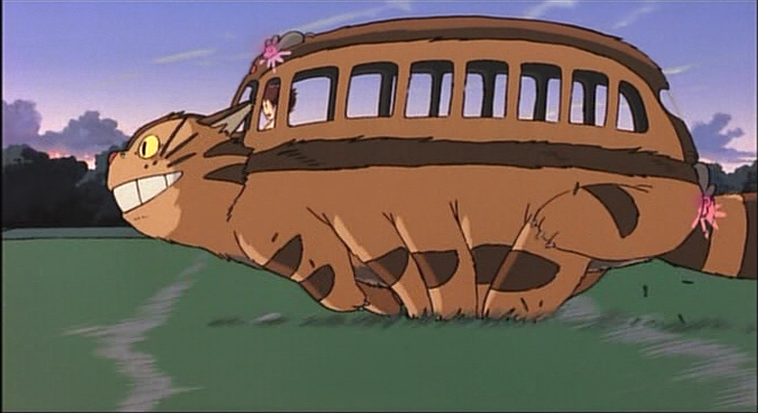 We reveled in this story — it doesn’t dumb down intrigue and fear at the expense of delight, and spins characters out of wonder–six-legged Catbus with furry interior, anyone? Now I’ll tell you why we’re all damn lucky. 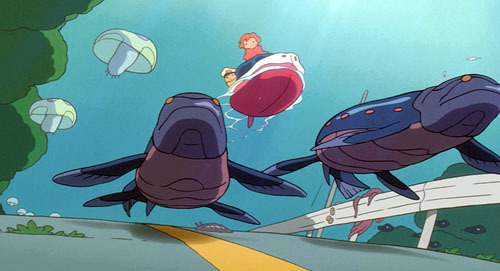 The studio (Studio Ghibli) and director (Miyazaki, who has quite possibly the most sparkly but respectable elderly man face ever) that made Totoro was pretty prolific, so there’s also Ponyo, which is Jonah’s favorite. And why wouldn’t it be? 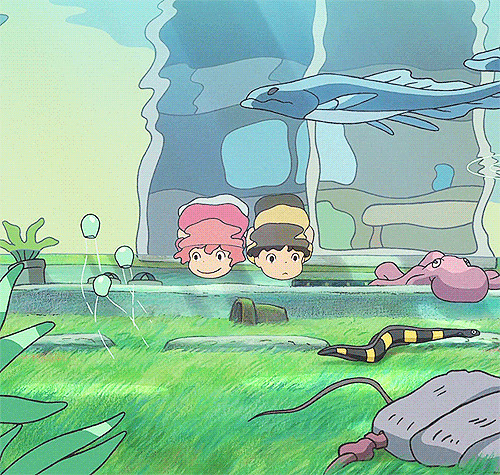 A five-year-old boy named Sosuke lives on a house that teeters over the ocean, where he gets to go and play by himself. He makes friends with a goldfish-turned-girl and names her Ponyo. Among other things, they float on top of their world–which is flooded by the ocean and all of its creatures–in a toy boat that uses a candle as its motor. And voila! Another gender-norm-bending, tender-hearted, just-spooky-enough adventure. And for those of you who have the time and desire to cook after a good bout of movie watching, I stumbled across this, a recipe for Ponyo noodles on a rad blog dedicated to “cooking and eating through children’s literature.” Recipe for crisp apple strudels and schnitzel with noodles, anyone?! Apparently, the other Miyazaki movie that’s gentle enough for little kids is Kiki’s Delivery Service. If you haven’t seen any of these, whether you have kids or not, run to your nearest video store (you can’t stream them online). These are my favorite kids’ movies. And yes, Kiki is great. Also, as the kids get older there are more Miyazaki treasures to discover, like Nausicaa Valley of the Wind, Spirited Away and Princess Mononoke. (Don’t wait for the kids to grow up to watch them yourself.) These are deeply moral stories, they’re gorgeous works of art, and the treatment of genders is always refreshing. Such powerful, beautiful films. Great post! Miyazaki is a wonderful filmmaker and I find myself loving these films as much as (if not more) the kids when we watch. I would also recommend The Secret World of Arrietty, Miyazaki’s take on the Borrowers.